Special Edition of 50 copies, each with a 12 x 9 inch gloss c-type print signed and numbered. The Special Edition is available exclusively from the GOST website. Please note: At the end of the series, 50 portfolio boxes containing the complete collection – the five books along with the Special Edition print from each – will be available to purchase for £1,000, with the price rising as the edition sells. Therefore the total number available of each print will be a strict edition of 100. Over the past six years, photographer Mark Power has travelled across the US to create a complex visual narrative of a country in the midst of change. This new book, Good Morning, America (Volume One), represents a personal and timely exploration of both the American cultural and physical landscape, and the divergence of reality and myth. 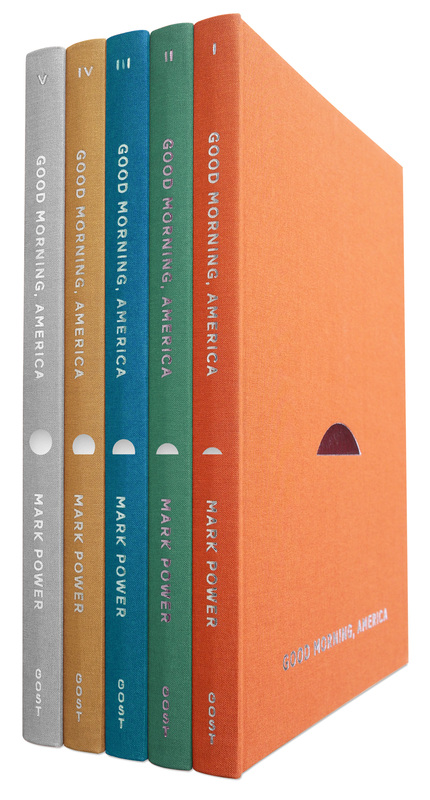 Good Morning, America (Volume One) is the first in a series of five books by Power, created as the result of this ongoing 10-year project, as he meanders back and forth across the vast country, taking long walks through towns and cities along the way. Most lengthy photographic surveys of the States, with Robert Frank being the most notable exception, have been made by Americans: Walker Evans, Stephen Shore, Joel Sternfeld. Power’s perspective, on the other hand, is as a foreigner, travelling to and from America on multiple occasions, thus allowing a mental and physical distance. As if in tribute to America’s vastness and culture, the resulting photographs are cinematic and epic in format. Power aims to finish the project in 2022, covering the whole of Obama’s second term, Trump’s first, and the start of whoever comes next. Mark Power (B.1959) studied painting at Brighton Polytechnic but turned to photography soon afterwards. He worked on editorial and charity commissions for ten years, before he began teaching at the University of Brighton in 1992. This coincided with a shift towards long-term, self-initiated projects which sit comfortably alongside large-scale commissions in the industrial sector. His work has been seen in numerous galleries and museums across the world, and is held in several collections, including the Arts Council of England, the British Council, the Victoria and Albert Museum, Los Angeles County Museum of Art, Milwaukee Art Museum, and Marrakech Museum of Photography and Visual Art. Power joined Magnum Photos as a Nominee in 2002, and became a full Member in 2007. He lives in Brighton, on the south coast of England. Good Morning, America (Volume one) is his tenth book.